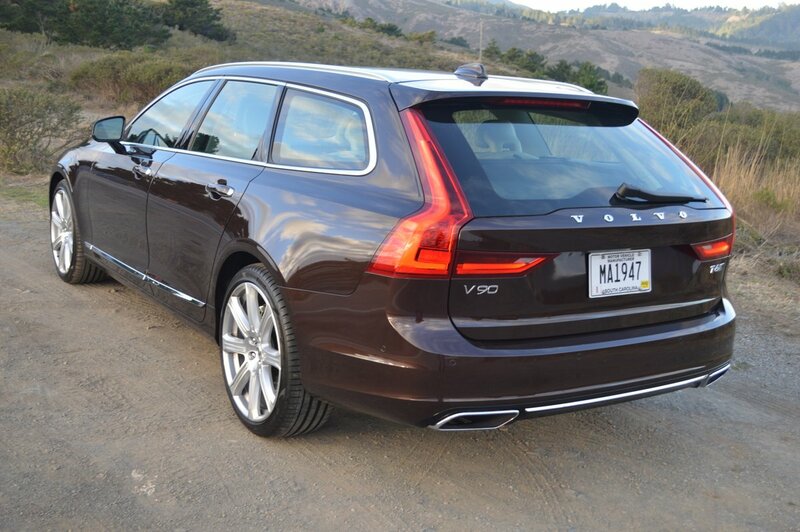 Your first and lasting impression of the V90 is one of surpassing beauty. 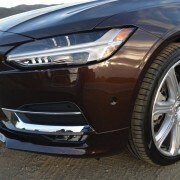 Its restrained styling provides more wow factor than the overwrought exercises coming out of Cadillac, BMW or Mercedes Benz these days. 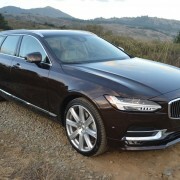 If you are looking for a station wagon with all wheel drive, sculpted in consummate good taste, stop by your Volvo dealer for a close look at the 2018 V90. 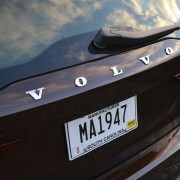 We spent a week cosseted inside the top line trim version of the V90 called the Inscription. 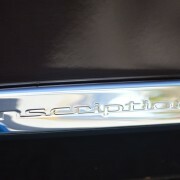 In keeping with this wagon’s understated good looks, the “Inscription” nameplate appears in just two places on this vehicle: a pair of chrome identifiers located almost out of sight on the lower front rocker panels. 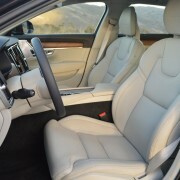 Inside, the V90 is exquisitely tailored. 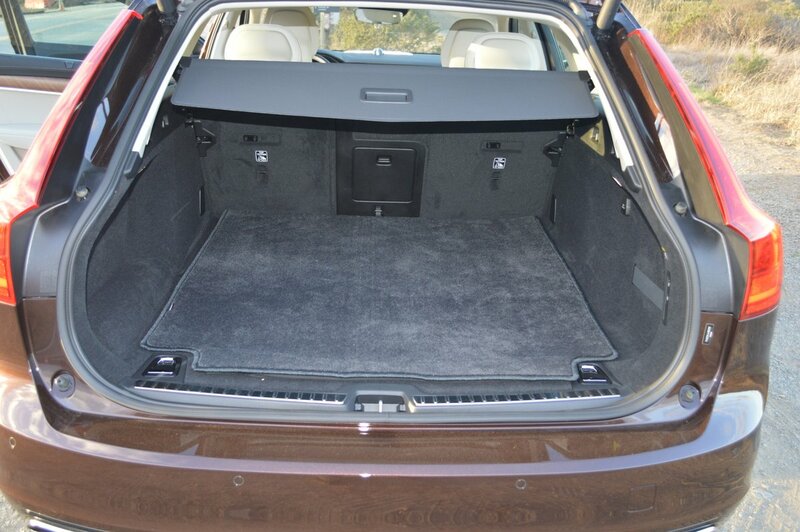 This wagon’s show car interior belies its base price of $57,950. 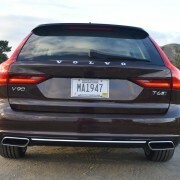 The first element that catches your eyes when stepping aboard is the illuminated threshold plate, done in matte aluminum with backlit “Volvo” lettering. 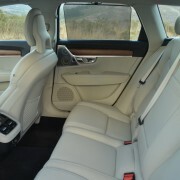 Slide into the French vanilla leather front seats and enjoy 10 way power adjustability and 3 stage heating. 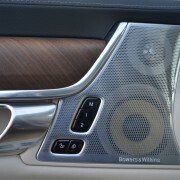 Savor the medley of linear walnut wood inlays defining all dash and door panels. 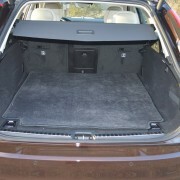 Slide open the enormous laminated panoramic moonroof to convert the interior to convertible airiness. 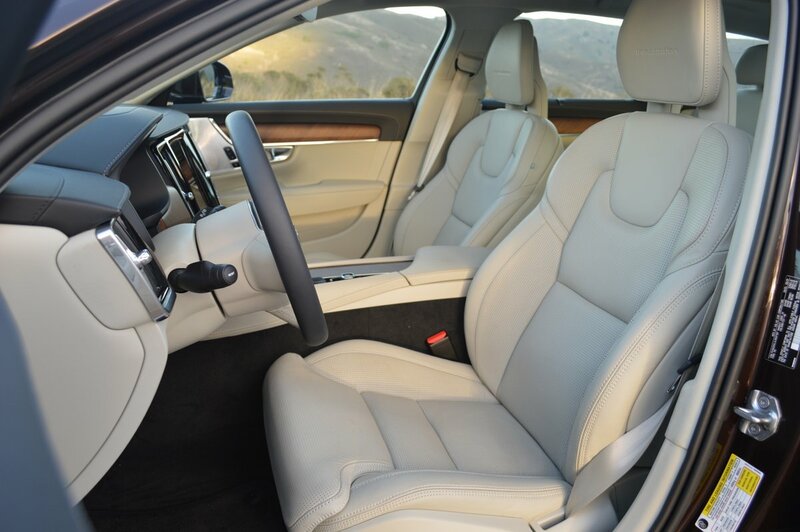 The V90 interior is a destination second home you always leave with some regret. 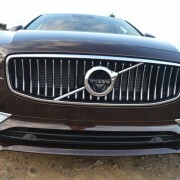 But this Volvo also scores points as a fun car to drive. 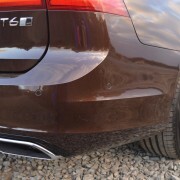 Under the wind cheating snout of our Maple Brown Metallic tester was a highly tweaked 4 cylinder motor displacing just 2.0 liters. 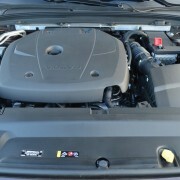 This relatively small engine leaves lots of room for people packaging in a car with an extravagant 111 inch wheelbase and a total length of 191 inches. 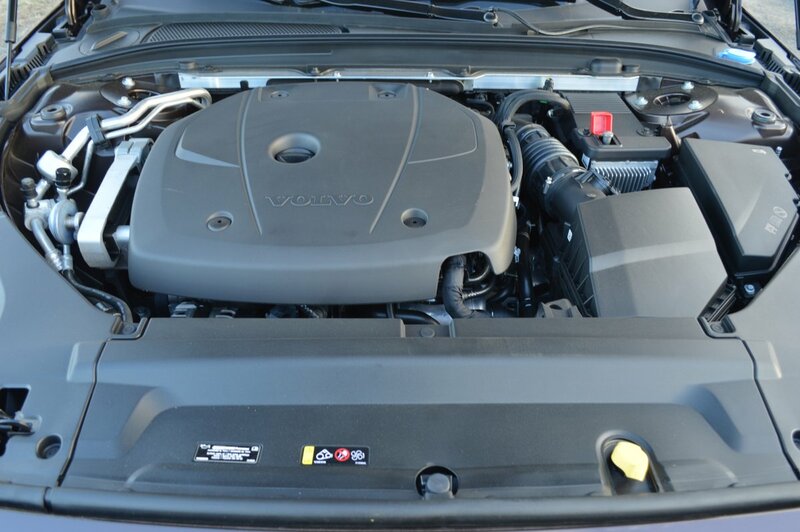 Volvo turbocharges and supercharges this motor to produce 316hp and 295lb.-ft. of torque. Because the torque peak arrives at just 2200rpm, you’re almost always guaranteed immediate response from this B4204T27 engine, which averages 25MPG in all driving. Helping keep the economical four banger on full boil is an 8-speed automatic transmission with enough ratios to insure immediate response to any acceleration request. 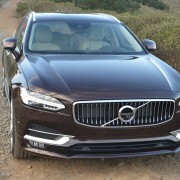 Volvo labels this sweet shifter “Geartronic” and equips it with am manual operation gate that allows you to select and hold your ratio of choice. Unfortunately, the Inscription model does not provide steering wheel mounted paddles to accomplish this task. 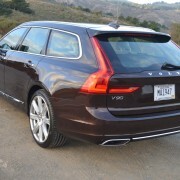 However, if you seek such paddles, the otherwise less lavishly equipped V90 “R” offers them as standard fare. 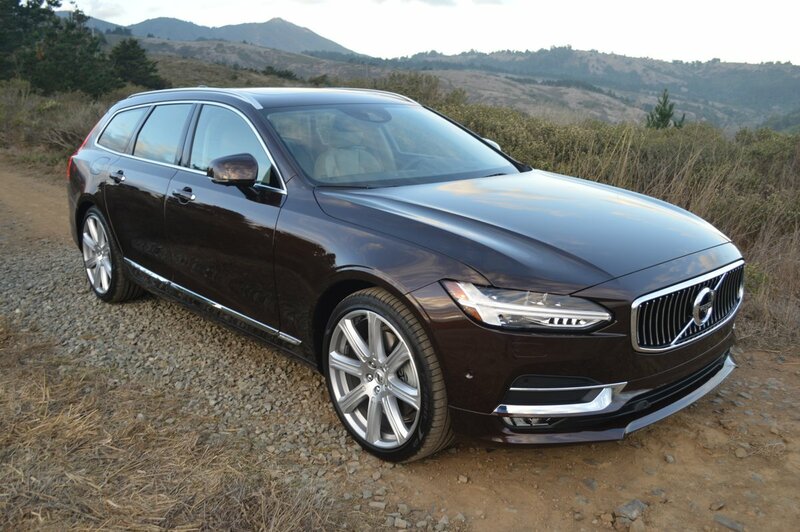 Volvo does not stint on the V90′s suspension of tire choice. Although this wagon weighs in at more than 2 tons (4,170 pounds), it never feels ponderous, even on back roads. 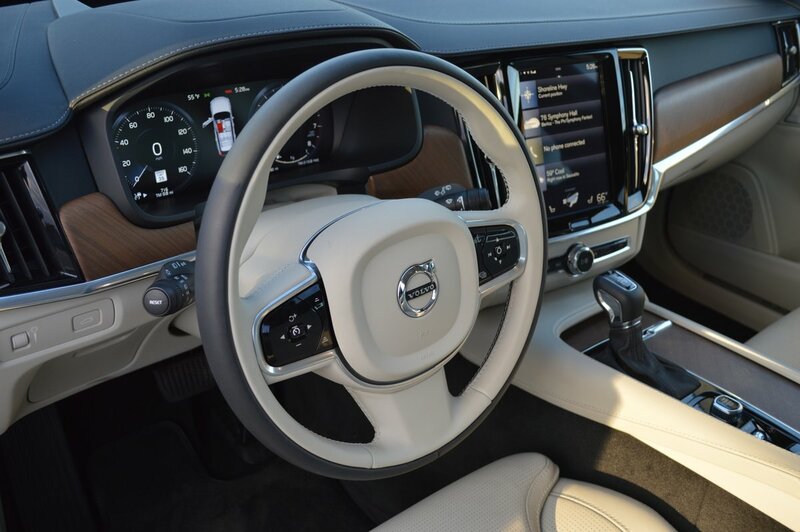 That’s because you can dial in the steering feedback and suspension behavior you desire by choosing a “Drive Mode Setting” from the four menu choices available: Eco/Comfort/Dynamic/Individual. 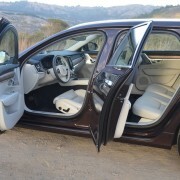 Before each drive, I generally opted for Dynamic. 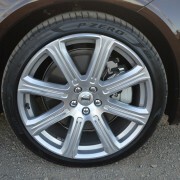 Eco or Comfort tighten up at freeway speed, but provide way too much power steering boost at lower speeds. 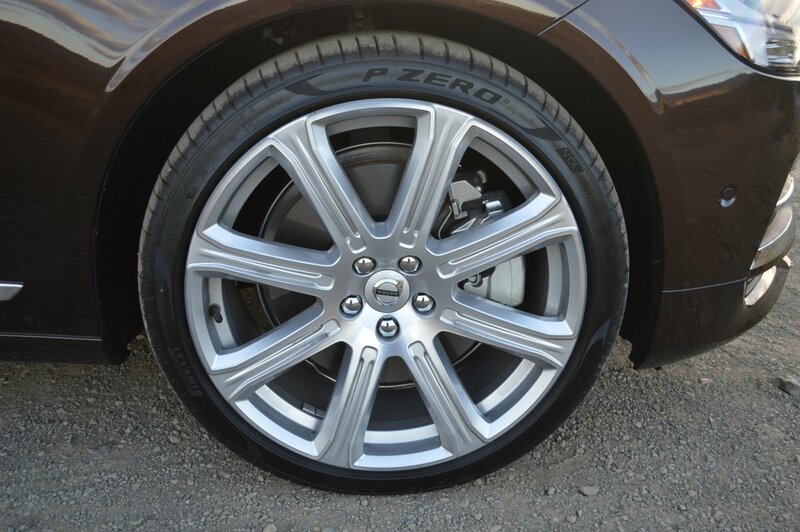 In any case, the Pirelli P Zero radials (255/35R20), mounted on Inscription specific 8 spoke alloy rims, never lose grip or traction on dry pavement. 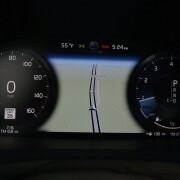 If the V90 has a weak point, it lies in the design and logic of the “Sensus Connect” system which regulates virtually all functions of this car through a 9 inch touchscreen/navigation unit centrally located on the dash. Figuring out how to operate this video screen is like searching for something specific at Ikea – you have to wade through the whole store before finding what you need. And just like Ikea’s bewildering maze of pathways, Sensus acts like a funhouse mirror. You’re never sure where you are, where you’re going, or where you’ve been. Ironically, for a company long celebrated for promoting safety in driving, this confusion causes inattention while driving. 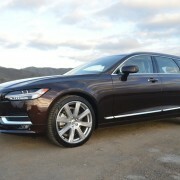 We even visited our local Volvo dealer for some help with Sensus and were instructed to issue voice commands when needed. We tried this repeatedly, but every time we wanted to raise or lower the interior temperature, the voice genie responded with help for the radio. 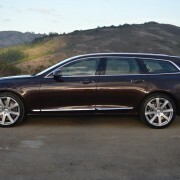 If Volvo ever decides to equip the V90 with good old fashioned buttons for control of the HVAC system, this wagon will merit unanimous praise. 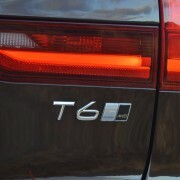 But until that time, the V90, lovely and comfortable as it is, merits a triple, not a home run.